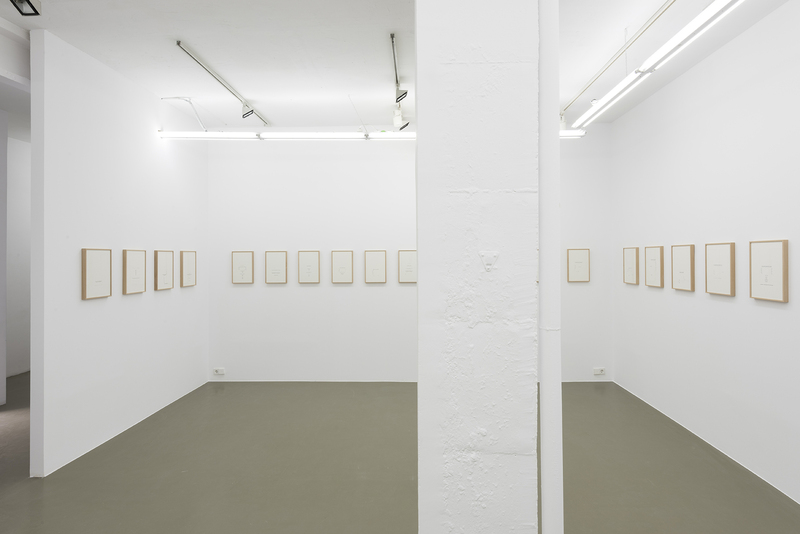 Maisterravalbuena is pleased to present “Selectric Works”, the first exhibition in Spain by American artist Jack Goldstein. Jack Goldstein (1945-2003) is considered one of the most important and influential artists of the generation after minimalism and conceptual art in America. Right after his death, the legacy of his work became especially relevant in the American and European cultural scenario, and he was praised in many publications and retrospective exhibitions that showed his great influence over later generations of artists. In 1971, Goldstein enrolled in the ground-breaking and rapidly seminal California Institute of Arts (CalArts), established the previous year with the aim of changing the model of artistic education in the USA. John Baldessari would be the most influential teacher in the School, and a key person to implement this new spirit through his influencial class of “Post Studio”, in which he challenged from the inside out the artistic education based on technical learning and the authenticity of the original, two of the defining and inherent characteristics of traditional studio practice. 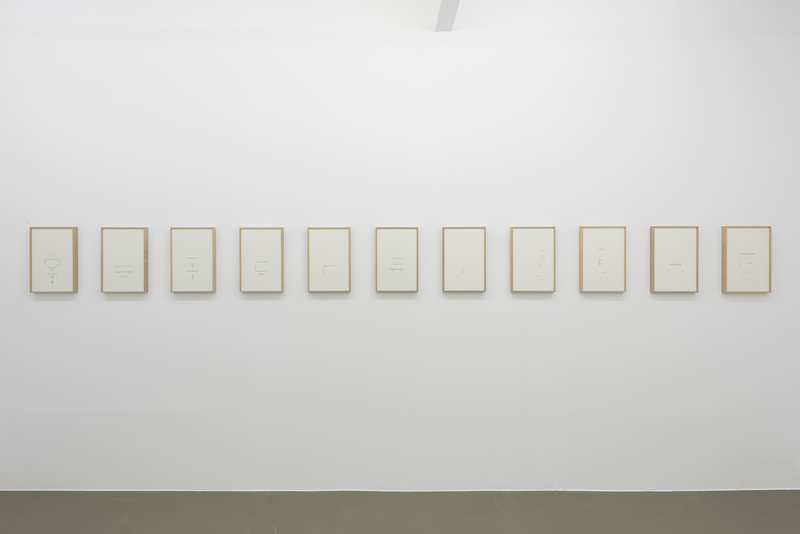 Baldessari’s core idea was that art cannot be explained; consequently, there are no hierarchical relationships between the teacher and the students, who are already considered artists with a critic discourse that cannot be displaced by one that has been previously determined by others. Goldstein, together with David Salle, James Welling and Matt Mullican, attended Baldessari’s classes, which were profoundly influential over their later practice, characterized by the use of images and narratives appropriated from mass media. In the mid-70’s, Goldstein, Welling, Mullican and Salle moved to New York and soon their presence stood out in the City’s artistic scenario, earning the name of “The CalArts Mafia”. 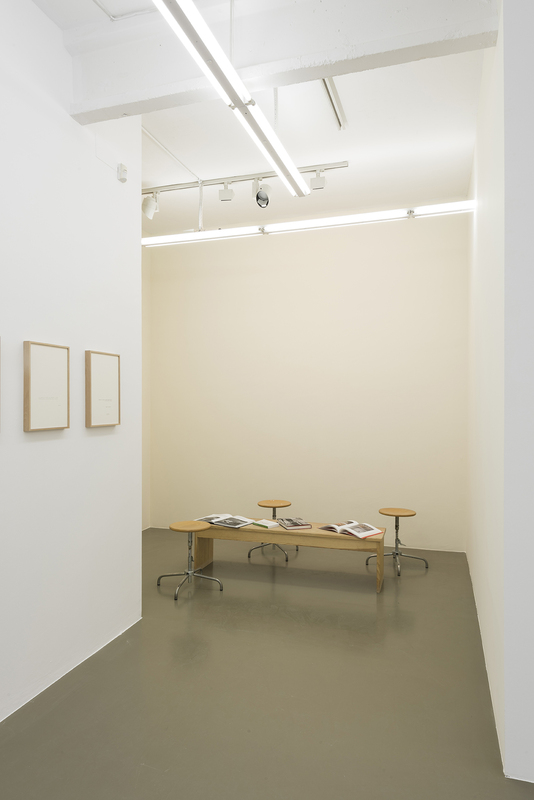 Their carreers’ launching was supported by a new generation of galleries opened in the early 80’s, like Metro Pictures or Mary Boone, and backed up by a flourishing art market, the strong resurgence of painting and the introduction of photography and mechanical copy as artistic languages. 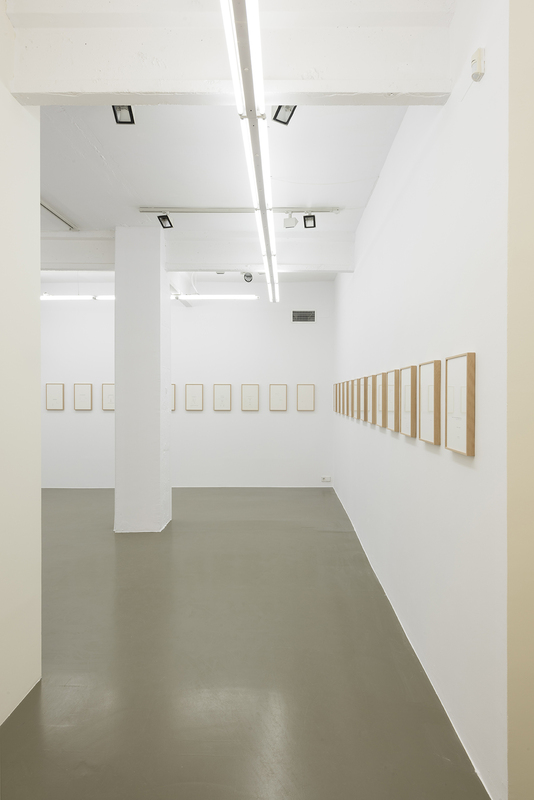 The phenomenon that brought up this new reality in the artistic ecosystem is “Pictures”, a seminal exhibition organized by Douglas Crimp in 1977 in the Artist Space of New York, directed back then by Helene Winer. 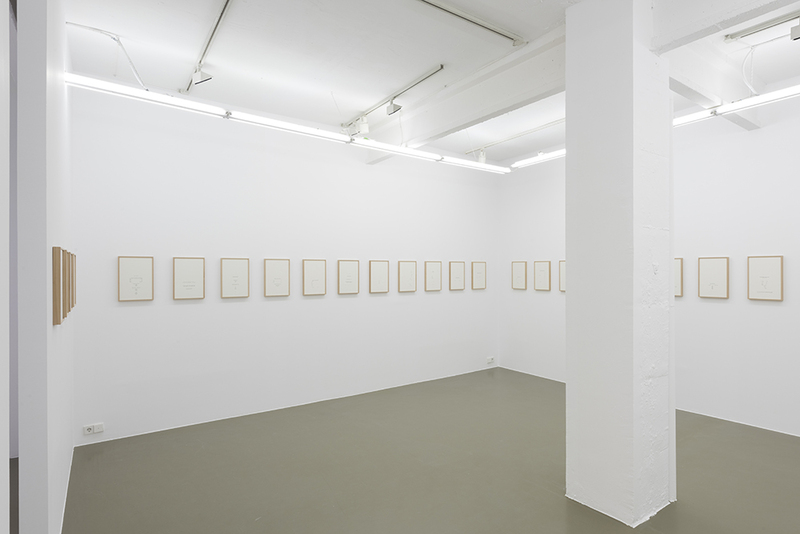 That show became a real statement of principles and the start of the so-called “Pictures Generation”, made up of a wide cross section of young artists whose careers started in the 70’s, who based their practice in appropriating consumption images from mass media which represent social, economic and gender stereotypes, in order to subvert and question their control. Beside Jack Goldstein, other outstanding members of the “Pictures Generation” were Cindy Sherman, Robert Longo, Sherrie Levine, Matt Mullican, Troy Brauntuch, Richard Prince, Barbara Kruger, James Welling, David Salle or Louise Lawler. 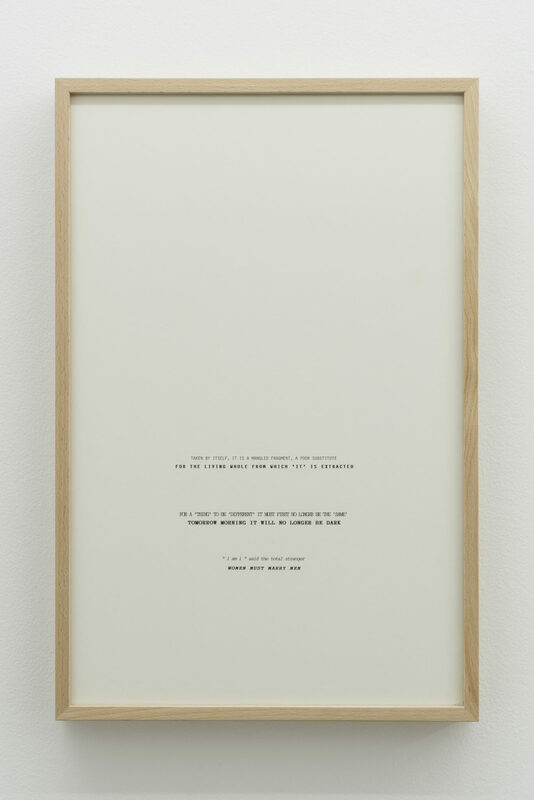 His text pieces are paradoxical works that confront his principle of stepping away, since they are the only works entirely made by him, without the assistance of collaborators. Goldstein worked with language from the beginning of his career: he wrote by hand his first texts. Little by little, those notes were substituted by typed texts with formal structures that progressively covered, in groups, the walls of his studio in the 506 Pacific Building in Santa Monica. His then neighbor James Welling immortalized those works and all the activity taking place in Goldstein’s studio with his camera. 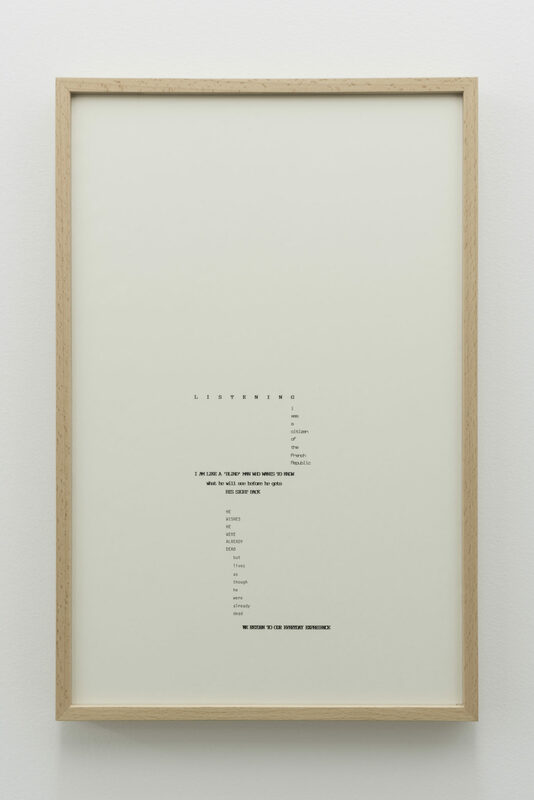 Those first typed texts were entitled “Aphorisms” and were presented for the first time in the Documenta of Kassel in 1982. The texts have the extension of one line and, as their title indicates, are treated like sentences presenting guidelines although, apparently, they are quite banal texts that make references to pop and consumption culture: e.g. “She stares in the mirror to be beautiful”, “The hero died in slow motion”, “The dog falls asleep to rock and roll music”. With this text pieces, Goldstein gets hold of the severity of the conceptual aesthetics of the previous generation to provide it with Pop’s mass culture contents. 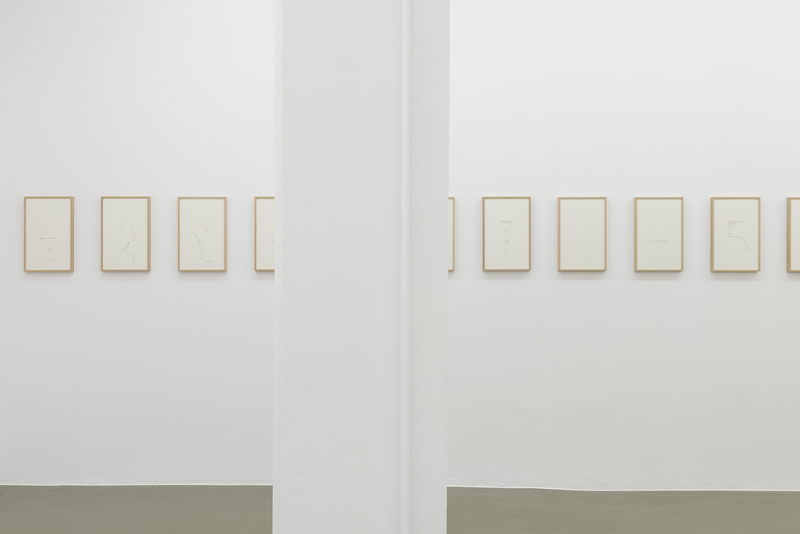 “Selectric Totems”, the series of drawings presented in this exhibition, was created between 1988 and 1990. 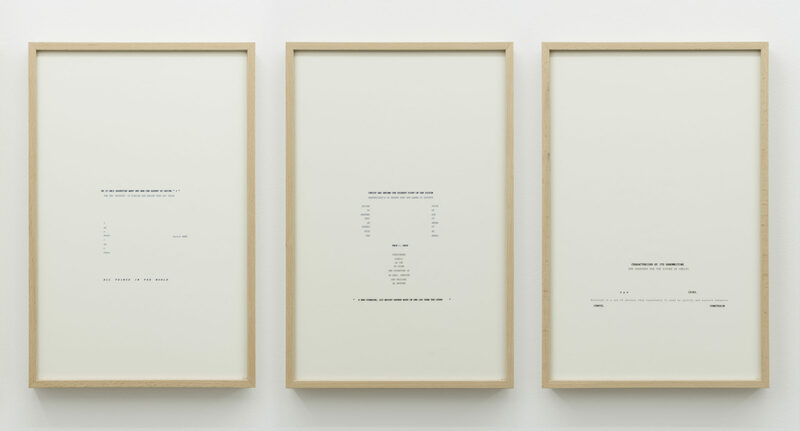 This series of drawings drafts the narrative structure that shall be found in “Totems”, 1990, one of Goldstein’s more praised pieces where, for the first time, he composed the text with the help of a digital processor and introduced clip art typical images. The name of Selectric refers to the electric typewriter model that IBM marketed in the 60’s decade. The great novelty here was its rotating system with the option to select different fonts. Goldstein used this resource to almost sculpt texts with different font sizes, and types. “Selectric Totems” is a more complex piece, both in form and in content, than “Aphorisms”. 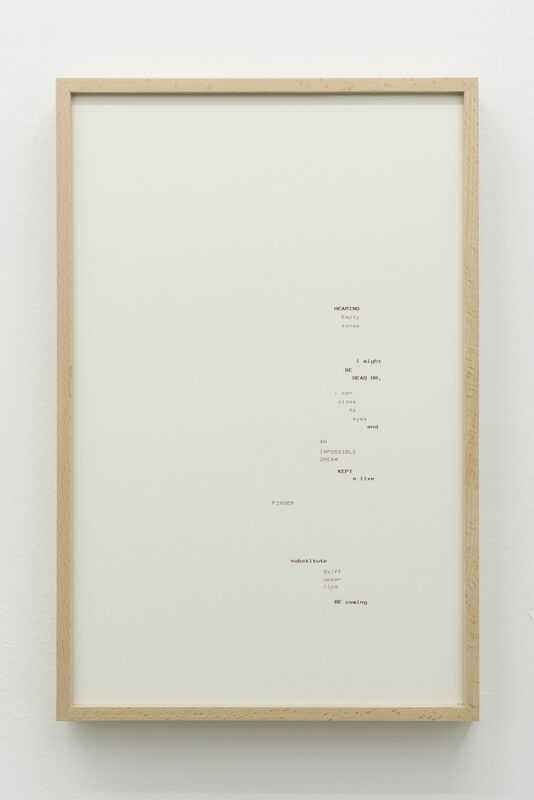 For the first time, Goldstein introduced external texts from very different sources, but he did not show them in isolation, like in “Aphorisms”, but confronting one to another in a fragmented way, so conditioning their previous meaning: “Travels in Japan without speaking the language”, “The creation of the works takes place every day”, “The difficulty of being precisely what you are”. This narrative complexity turns “Selectric Works” in an essential precedent to understand Goldstein’s work from the last years of his life, when he cloistered in his caravan: “Selected Writings”, 1993-2000. A work made by 17 notebooks and a vast number of texts taken from hundreds of books that Goldstein read during almost one decade.